Rick Saccone, Republican candidate for Pennsylvania's 18th Congressional District, takes questions form reporters last week in Pittsburgh. Saccone has needed millions of dollars in spending from Republican allies to stave off a strong challenge from the Democratic candidate, Conor Lamb. The Center for Responsive Politics reported Friday the two sides had spent a total of $15.6 million — slightly more than the most costly House races in 2016, although far less than the maelstrom of a special election in Georgia last year, which cost $69.2 million. Republicans have poured more than twice as much as Democrats into the Pennsylvania race. That flood of spending comes even though the district won't exist after this November's election, following the state Supreme Court's decision to redraw Pennsylvania's 18 congressional districts. Neither Lamb nor Saccone will reside in the redrawn district. Registered Democrats outnumber Republicans in the 18th, but it votes Republican. Trump carried the 18th in 2016 with 58 percent of the vote. Republican Rep. Tim Murphy represented the district from 2003 until this year. He resigned because of an extramarital affair in which he suggested his partner get an abortion. Tuesday's election is to choose his successor. Republicans fear that a loss will chill their hopes of holding control of the House this fall. There's anxiety that if Lamb wins, more Republican incumbents will join the record-setting 37 of their colleagues already headed for the Capitol Hill exit ramp. White House counselor Kellyanne Conway campaigned for Saccone last week, and President Trump flew in for a rally Saturday. Donald Trump Jr. is expected to campaign for Saccone on Monday. Vice President Pence campaigned with Saccone in February. High-level administration officials, including Interior Secretary Ryan Zinke and Ivanka Trump, also held well-publicized official events with Saccone. Among the luminaries who have stumped for Lamb is former Vice President Joe Biden, who visited the district last week. Saccone's small-town style of campaigning has put him nearly on the sidelines of the campaign. As of last week, he had spent $613,000 to Lamb's $3 million. 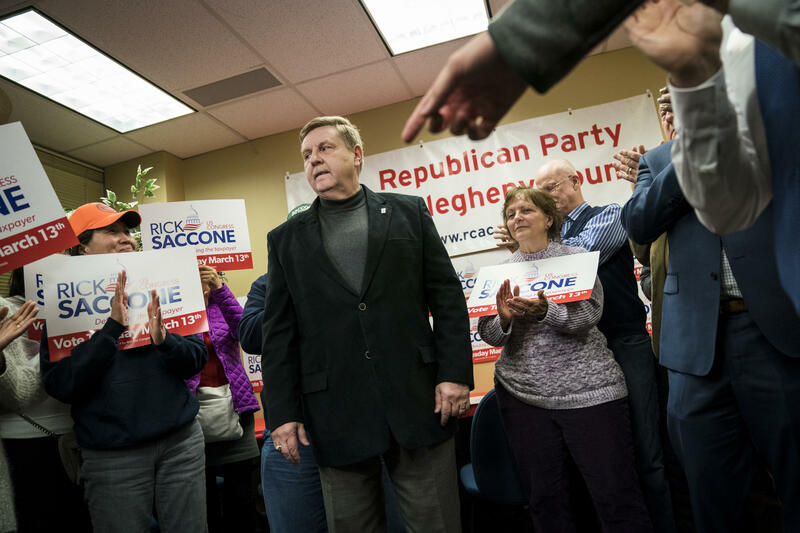 "Rick Saccone has had difficulty raising money, to be candid," a Republican political operative familiar with the race told NPR. He said Saccone "doesn't have a natural fundraising base [and] has never really had to do it" in his campaigns for the state Legislature. So the energy behind the Saccone effort is brought in from Washington, D.C.: the National Republican Congressional Committee and Republican National Committee, plus superPACs Congressional Leadership Fund and America First Action. They and their allies have spent $10.3 million, versus $1.7 million by pro-Lamb entities. "Normally this would be a bad strategy [for Republicans], but it's clearly the way to stay competitive," said political scientist Michael Franz, with the Wesleyan Media Project, which tracks campaign advertising and spending. He said that ordinarily, "it could lead to repeat messages or competitive messages," which would hurt, not help, the candidate. In the 2016 elections, Murphy ran unopposed and spent $1.5 million. No outside groups got involved.